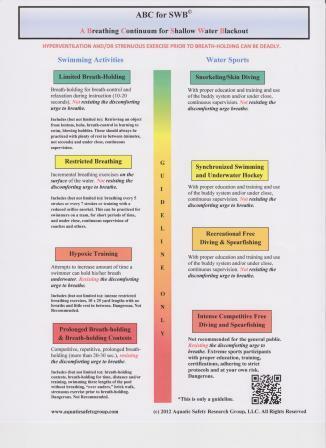 practice prolonged underwater breath-holding are particularly at risk of SWB. Prior to submersion, swimmers blow off an excessive amount of carbon dioxide through voluntary hyperventilation (intentional quick breaths in and out) or involuntary hyperventilation (strenuous exercise, excitement, anxiety). When the oxygen level in the blood runs low before the carbon dioxide level rises to the point that triggers the breathing reflex, the swimmer loses consciousness. The swimmer never actually feels as though a breath is needed. Once submerged underwater, the swimmer is hidden from the view of lifeguards by surface glare and ripples/waves on the surface. A series of events is then triggered, including the inhalation of water, possible convulsions and ultimately cardiac arrest and death. Additional information is available on our Shallow Water Blackout DVD. Anyone who practices competitive, repetitive underwater breath-holding is at risk for Shallow Water Blackout. A recent series of deaths of healthy, athletic males, ages 15-26 years, all of whom were capable to strong swimmers, but yet who died in shallow water often near the side of the pool, suggests that common victims of Shallow Water Blackout tend to be male swimmers who engage in underwater breath-holding contests for time or distance. However, it is important to note that gender does not play a significant role in SWB other than to suggest that males may practice this dangerously competitive activity more than females. Shallow Water Blackout - Surprising Statistics! Check out Shallow Water Blackout Prevention Non-Profit Organization's new website. Participate in Aquatic Safety Research Group's efforts to track incidents of Shallow Water Blackout. Brand New ABC for SWB! All new guideline to help show what activities can be safer if practiced properly and which activities are high risk and potentially deadly. This is not definitive across all situations - it is only a guideline to help illustrate breath-holding activities that could lead to Shallow Water Blackout.